June 1693. It has been nearly a year since Susanna Jameson's beloved grandmother, Susanna North Martin, though innocent, was hung as a witch. Mrs. Martin's namesake, despairing over the loss, is having a crisis of faith. Hoping to lift her daughter's spirits, Susanna's mother convinces her to visit their friend, Madeline Osgood. Upon Susanna's arrival, she makes the acquaintance of her elderly friend's handsome neighbor and business partner, William Gage. While surveying the beautiful young woman, he is immediately captivated. Soon the pair's interest in each other grows. However, through no fault of his own, Mr. Gage finds himself concealing a terrible secret which a former acquaintance—who is also attracted to Susanna—if given an opportunity, would eagerly reveal. What will happen? Will the rival disclose William's secret in order to win Susanna for himself? What is more, will she be inspired by Madeline's unshakable faith to rekindle her own? 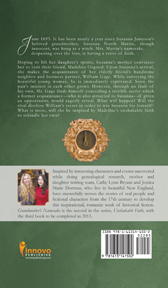 Inspired by interesting characters and events uncovered while doing genealogical research, mother and daughter writing team, Cathy Lynn Bryant and Jessica Marie Dorman, who live in beautiful New England, have masterfully woven the stories of real people and fictional characters from the 17th century to develop this inspirational, romantic work of historical fiction. 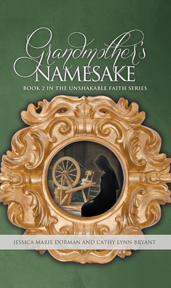 Grandmother’s Namesake is the second in the series, Unshakable Faith. —Kristie Pelletier, writer for Environmental Perspectives, Inc.